While competing against teams named Motley Poo (Chesapeake Water Environment Assoc), Poo Fighters (Pacific Northwest Water Environment Assoc. ), Royal Flush (Water Environment Assoc. of Utah) and Sludge Hammers (Water Environment Assoc. 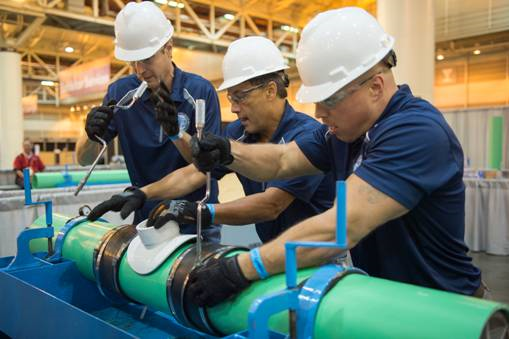 of Ontario), the Metropolitan Water Reclamation District of Greater Chicago (MWRD) Sewer Rats wrapped up their 2016 season during the national Operations Challenge event held at the Water Environment Federation Technical Exhibition and Conference in New Orleans last month. The Sewer Rats team consists of John Conry, Josh Filler, Sandra Matual, and John Malinowski who work in maintenance and operations at the MWRD. Competing in the Operations Challenge is an excellent opportunity for teams to showcase their skills and expertise while providing an excellent training tool for everyday skills, such as safety and maintenance, and a way to cross-train employees. "The Sewer Rats show how the agency makes clean water a priority," said President Mariyana Spyropoulos. Vice President Commissioner Barbara J. McGowan said that "we are proud of our hardworking, talented Sewer Rats. These employees represent the District well and show the world why the MWRD is a leader in water treatment and water quality." There are five events during the Operations Challenge where the four-person team must complete a task related to maintenance and operations at a water treatment plant. These events include lab work, process control, collections, maintenance and safety. All events were timed with the goal being to complete the event in the fastest time without any penalties. Commissioner Kari K. Steele, herself a former MWRD lab technician, spent a large portion of WEFTEC cheering on the Sewer Rats. "It's a lot of fun watching them work, and I feel it's important to show our support," said Commissioner Steele. "I know it can be very stressful, especially when you are racing against the clock while every task is being judged, but our team did extremely well under pressure." As part of the lab event, operators are required to run samples of ammonia and alkalinity to determine basic alkalinity needs of a treatment plant. Determining alkalinity is crucial in the water treatment process to ensure a waterway's ability to neutralize acid upon receiving treated water. Teams then perform calculations to identify if adequate alkalinity is available to provide complete nitrification. While only four members of the team are allowed to compete, the team received assistance and coaching from fellow MWRD employees. Ed Staudacher, manager of the team, credited lab staff, including Vic Olchowka, Anas Rabah, Sandra Conrad, Rebecca Rose and retiree Tom Liston, for their mentorship and knowledge in preparing the team. "We thank the staff for their participation, dedication to their craft and extra hours spent training for this competition," said Commissioner Timothy Bradford. Commissioner Frank Avila agreed. "We hope this work gives area residents comfort in knowing that our employees pay the utmost attention to infrastructure and water quality issues." 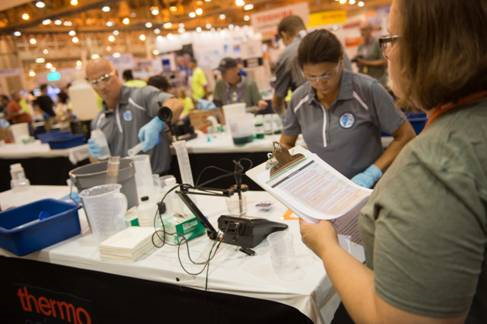 MWRD employees and Sewer Rat team members, Josh Filler, an electrical mechanic sub-foreman, and treatment plant operator Sandra Matual compete in the laboratory event at the Operations Challenge held at the Water Environment Federation Technical Exhibition and Conference at the Morial Convention Center in New Orleans. (L-R): John Malinowski, John Conry and Josh Filler install a new section of pipe in the collections event during the Operations Challenge. 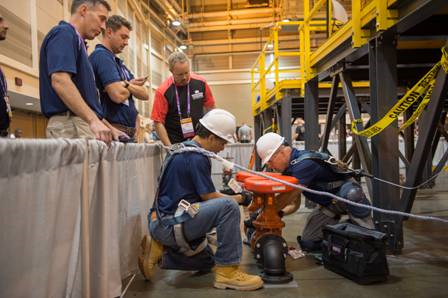 (L-R): Ed Staudacher and Matt Jurjovec cheer on John Conry and Josh Filler as they repair a check valve in the safety competition during the Operations Challenge.